Patchwork Quilts hold a very special meaning in the history of women throughout the world and particularly America. 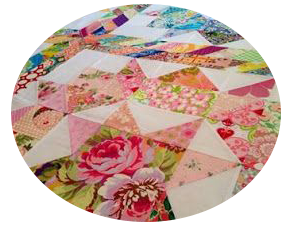 Quilting was often one of the main reasons to get together with other women in the community (quilting bee). This was often the time where women shared stories and taught the younger generations not only how to sew but how to look after a house and a family. 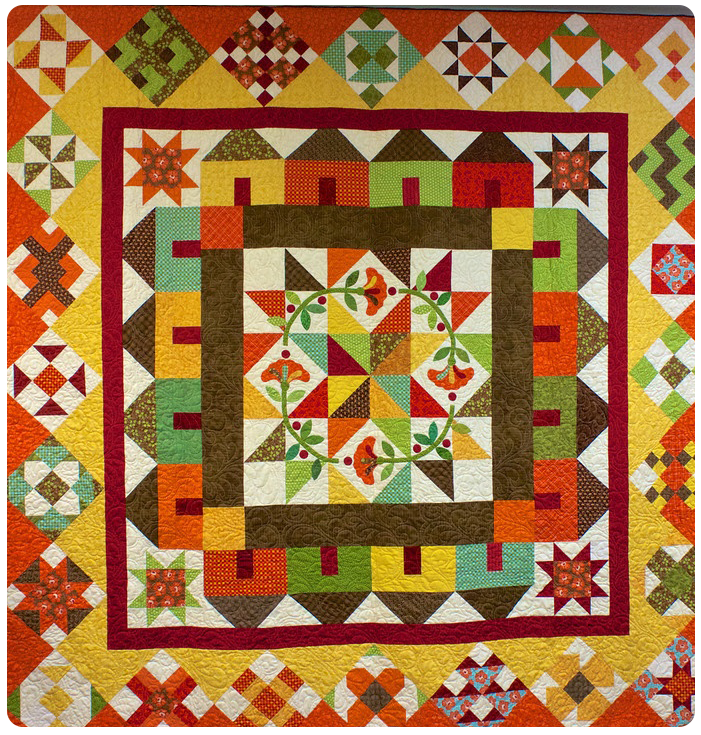 Patchwork quilts were introduced to America by emigrants. These emigrants, mainly from Ireland had a long tradition of making patchwork. Patterns, fabrics and quilting ideas were sent back and forth across the Atlantic keep both cultures up-to-date on what was going on in each other’s worlds. Patch-working is the process of sewing little patches of cloth together. These pieces can be cut in many different shapes and sizes. They are the sewn together to generally make a pattern or blocks of pattern. The quilt blocks are then sewn together to make the quilt top (top layer of a quilt sandwich) and then finally into a quilt. Originally many quilts were made out of necessity to keep warm in winter and quilting was a much more common craft in the northern states where they not only beautiful and fun to make, but a practicality during the cold winter months. 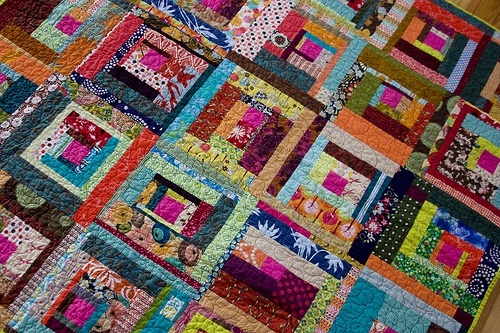 Many patchwork quilts are made from scraps of materials and were considered a great way of using up left over and small pieces of different styled and colored fabric. Alone the fabrics were worthless and couldn’t be used to make anything of decent size, however when cut into small shapes and patches and then pieced together they could make amazing quilts. 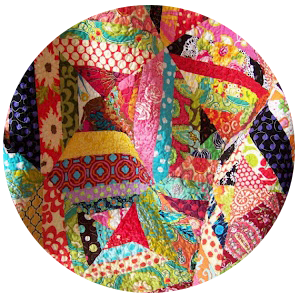 Check out our section on patchwork quilt patterns for help on making your own patchwork quilts. The American women often named quilts after events and traditions in their everyday lives. 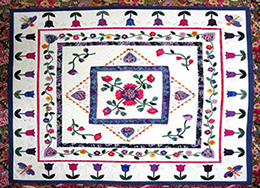 The Log Cabin pattern is one of the most popular patterns for patchwork quilts. It is said that this pattern resembles the American tradition of building houses from logs. It is also a great quilt to make when fabric is limited because you are able to use many small pieces of different fabrics and still create a fantastic quilt with a pattern. 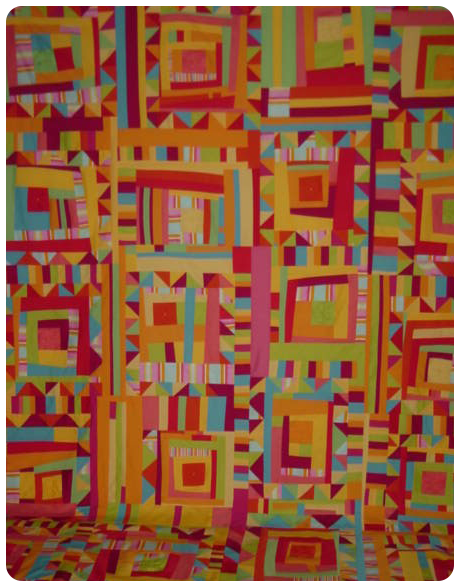 The Log Cabin design has often been creatively altered by numerous quilters to produce an individual approach to one of Americas more traditional quilt patterns.